I pulled out of the box and I was like "huh". I really felt deflated. I've grown to like it, but it just wasn't what I expected. As for the formula, you will need to go slow, and realize that unlike other RBLs, it doesn't flow on the nail. You have to work at it. Once you have the first coat on, it goes on better, but it's still stringy. It's not something that isn't manageable. But, it's not $20 awesome. I think it's one of those colors that doesn't play nice with cameras, so it's hard to get it completely accurate. I know when I saw pictures of it when the 4 bloggers posted their reviews, I immediately fell in love with just how vibrant it was. Thing is, while it's still very blue, and quite bright, there is a dustiness that I didn't expect. It also isn't as electric as pictures portray. It's still really pretty, just not unbelievably gorgeous. When you apply it, be sure to use 3 or more coats, as a lot of the issues I had with the color all but disappeared after 3 coats. 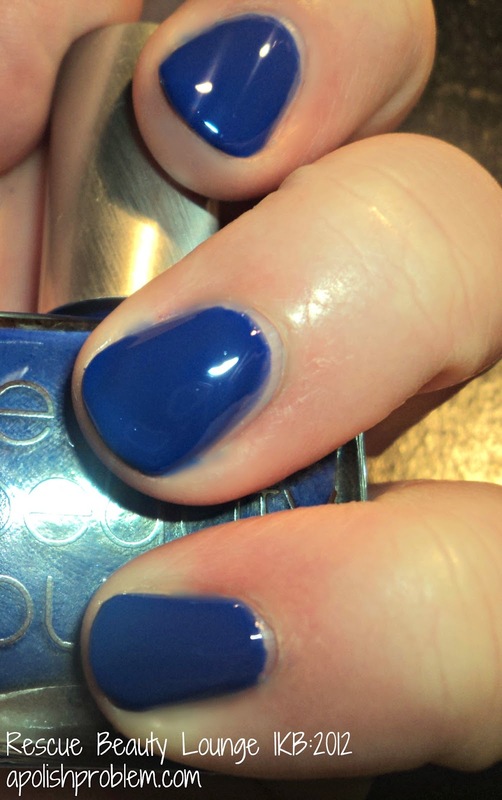 You have to try Revlon Royal, I think it's what you were wanting this to be! I wanted to look up some nail polish blogs to let ladies in on a new nail shield fashion trend. BTW I love the idea raising awareness (we have some like that too) Anyways, check me out... my site is www.michellep.jamberrynails.net and let me know what ya think!